The logis is situated amongst the vineyards of the Grande Champagne region, famously known for having the best Cognac vines in France. It is set in a beautiful rural location, within minutes of the capital of the Grande Champagne, Segonzac where there is a bakery, supermarket, tabac, pharmacy and post office. The house lies within 2 acres of enclosed grounds, which include an orchard, courtyard, pigeonnier, and 10 x 5m swimming pool. The logis will be your gateway to a great vacation, outdoor living, and a family hideaway with simplicity, rustic lifestyle and a relaxed elegance. With large light rooms, carefully renovated with period style furniture it will feel like home from home. 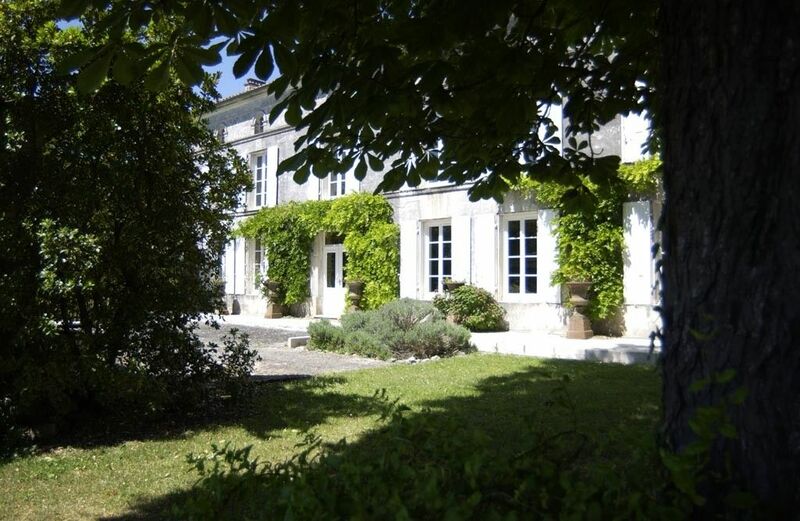 Location: This 18th Century charentais logis, has large light rooms. It sits amongst the vineyards of the Grande Champagne region, famed for being the most impressive region of the Charente. The nearby town of Segonzac, just a 5 minute drive away has a supermarket, pharmacy, bakery etc. And the nearby village of Juillac le Coq, a 2 minute drive away has a bakery, post office and a petrol station. The 2 acre garden is completely enclosed by thick bordering fir trees and has open spaces for Badminton etc. The swimming pool and garden are south facing. The Surrounding Area: The pretty town of Jarnac, birthplace and final resting place of Francois Mitterand lies against the backdrop of the River Charente. Just a 10 minute drive away it also provides enjoyment for fishing and boating enthusiasts. Jarnac is also home of the famous brandy house ‘Courvoisier’. The lovely town of Cognac, home of the famous brandy houses ‘Camus’, ‘Hennessy’, ‘Martell’, ‘Otard’, and ‘Remy Martin’, is about a 15 minute drive away, where most of the distilleries offer free tastings and tours. With its pretty streets, markets and street cafes the beginning of September sees the 'Coup de Chauffe' festival, where the emotion teasers, smooth talkers, barkers and street knockers wander in the ‘eaux-de-vie’ city streets, and the beginning of August sees the streets filled with Blues, Soul Music and Jazz resonating from the jamming sessions between amateur and professional musicians. Additional Attractions: The fantastic ‘Puy du Fou’ show retells local history in a spectacle of fireworks, fountains, lasers and stunt riding against the flaming background of a ruined fortress. There are shows every weekend from June to September, and is well worth the hour and a half drive. Futuroscope is about an hour away, and shows cutting-edge modern film techniques, with a screen the size of a 7 story building and a dome shaped cinema which gives an illusion of solidity and an underfloor screen that makes you feel like you are airborne. It also has a giant 3D cinema. The beautiful wild ‘cote savage’ is under an hour away where there is miles of long, golden unspoilt beaches. Or visit the ‘Marais Poitevin’, known as the Venice of France. The nearest golf course is in Cognac, which is about 15 minutes away. A beautiful house with a beautiful pool and great gardens. Plenty of space for everyone; we had a great time. The house and grounds were absolutely beautiful. We were delighted by both the house and gardens. The house was lovely with everything you could require. The gardens and pool were very well maintained. A great holiday! Beautiful and peaceful property perfect for a relaxing holiday !!! We loved it we had a wonderful time !!! Great communication !!! Nous avons adoré cette belle demeure et son cadre verdoyant. Nous avons passé un séjour magnifique en famille. La maison est spacieuse et a un charme fou. Nous avons bénéficié d'une météo magnifique qui nous a permis de déjeuner dehors tous les jours. This is a great property for a large family / group holiday where you want to get away from it all. The house and grounds are fantastic, plenty of space and room for everyone. The pool is fantastic and was the focal point for our stay. The bedrooms are all clean, massive and all have different features while the bathrooms are excellent also. The house is located out amongst the vineyards, but only ten minutes from the local shops. All in all, it was exactly the place we were looking for - lots of space, fantastic gardens and a great pool. Recommended. To start with this property is one of a kind. Remembered us of an old hunting lodge brought to modern times by its owners still keeping the charm and character. The property is massive with a little orchard, swimming pool and enough space to fit a wedding party. The positioning its just perfect in the middle of a sea of vineyards in Grand Champagne area. Segonzac is only 5 mins drive or 15 mins by bike (provided at the property) and it hosts a number of Cognac producers, all very keen to show their passion for Eau de Vie. Cognac city it's at a short drive away and it will show a little of its history to everyone passioned. Food scene is as expected in France and we were helped by the owners who provided very insightful comments about the nearby restaurants. Overall we had an amazing time in Charente and this superb property enhanced its reputation. I definitely recommend it to anyone looking for some French countryside charm. The village of Juillac le Coq is a 2 minute drive away and has a bakery, post office and petrol station. The small town of Segonzac, capital of the Grande Champage region is a further 5 minutes and has all the other local amenities that you would need. The famous town of Cognac with it's famous distilleries is a 15 minute drive as is Jarnac, birthplace of Francois Mitterand. Situated about an hours drive from Bordeaux airport and just over an hour from Poitiers and La Rochelle airports, both served by Ryanair the property will be even more easily accessible from 1st April 2008 when Ryanair start flying to Angouleme. Angouleme is just 30 minutes away and also has a train station as does Jarnac at 15 minutes. Car hire is available at the Airports through Avis, Hertz, Rentacar etc.